International wars, civil wars, occupations, dictatorships and communism are all usually bad ingredients for national foods. Eastern European cooks have had to create recipes from what was on hand for so many long years and harsh times that the typical national meals that survive to this day are truly salt-of-the-Earth dishes. From Poland to Slovenia to Bulgaria, Eastern European cuisine is hearty soul food, full of starches and stewed meats. To wash it all down, these countries also have serious drinking traditions. From the wonderful beers of the Czech Republic to the ubiquitous fruit spirits, Eastern European dining demands strong livers, big stomachs and, most importantly, great appetites. Here are eight must-try Eastern European foods and drinks. This is a strange-yet-wonderful food and also the number one Hungarian street food. Langos is a thin piece of wheat dough deep fried then slathered in garlic, a thin yogurt sauce and grated cheese. It’s wonderful. The dough, which can seem soggy straight out of the fryer, turns crisp on the outside and pillowy on the inside. The garlic — there seems to be 10 cloves on top of the dough — could make your breath rank for days, but the yogurt sauce smooths everything out. Once you find a street stall or a food truck that makes it just the way you like it, you’ll keep going back for more. This eau de vie — fruit brandy — is essential to all parts of Eastern Europe. It’s name is, in fact, one of the only words that remains the same nearly everywhere in the region, from Germany to Ukraine: slivovitz. Usually made from plums at around 55 percent alcohol by volume, slivovitz is to Eastern Europe what vodka is to Russia. It’s considered a “national drink” in the Czech Republic and Serbia, and is very popular in Jewish communities throughout Eastern Europe. In Hungary, a very similar drink called palinka is the national symbol, while in Romania, it’s tuica. 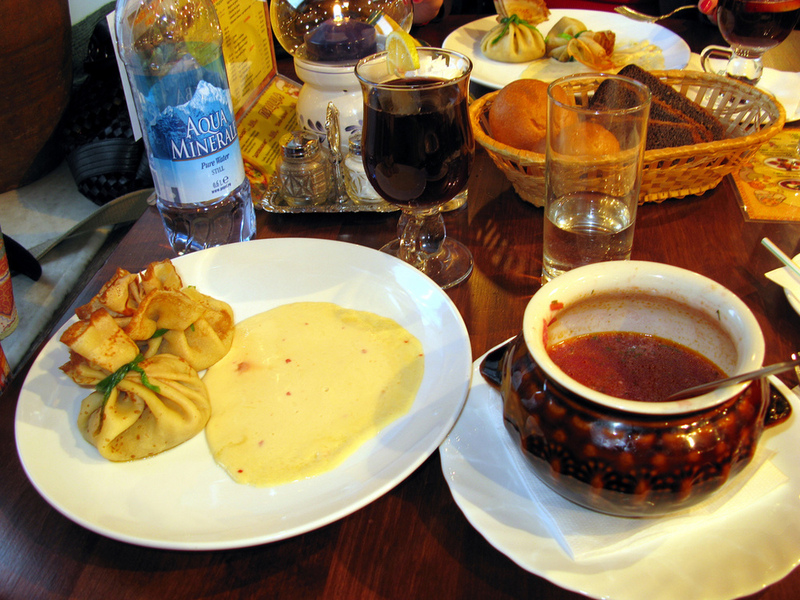 The national dish of Poland is also very popular in the Czech Republic, Germany and Austria. It’s a pretty simple dish: pork knuckle roasted then braised for hours. It’s usually served with sauerkraut and potatoes. The skin of the pork melts in your mouth, and the meat is soft and salt. It’s quite greasy, but the potatoes mop up everything well. Best of all: It goes perfectly with beer! The kebapche is the Bulgarian version of a dish served all over southern Eastern Europe, which is similar to the more well known kofte kebab. These “rods” of ground pork and beef are strongly spiced with cumin and other herbs, and served with sour condiments. Yet another dish that screams for a mug of beer! This is a complicated matter: Believed to originate with the Ottomans, burek is a pastry that can be stuffed with basically anything. It’s found everywhere in the Arab world, Greece, Turkey and, of course, parts of Eastern Europe. The Bosnian version is filled with minced meats and is rolled up, but in the rest of ex-Yugoslavia, it’s basically a meat pie. In Bulgaria, it’s stuffed with eggs or eggplant, and many other cultures use sweet fillings. Needless to say, every version is wonderful, particularly when freshly baked. Beer is called pivo in 12 different Eastern European languages, including Czech, Serbian, Croatian, Slovenian, Russian and Ukrainian. And in many parts of Eastern Europe (Serbia comes to mind), you’ll find cheap pivo in the same two-liter plastic bottles reserved for soda in the U.S. So forget about the expensive imports, chuck that awful Heineken and go with the cheap local beer. Just ask for pivo while gesturing something large with your hands. They’ll know what you mean. This is the Bulgarian sweet par excellence. Halva is extremely popular everywhere from the Middle East to India to North Africa and back to Eastern Europe. Bulgarians in particular are extremely fond of it. It’s in every food shop, and they’ll usually carry many, many different versions. Halva looks like a white brick of sugar, but that’s misleading. Inside, it’s rich with sticky, chewy, nutty deliciousness that goes just right with a cup of tea. This is sausage in all Slavic languages, though with small variations in spelling and pronunciation. A trip to Eastern Europe cannot be complete without sampling the enormous, mouthwatering array. Fresh, ready-to-eat, smoked, dried, aged — try them all. Karnache and nadenista, two Romanian takes, are particularly spectacular. Kielbasa also pairs phenomenally with beer — notice a pattern here? Have you ever tried any of the foods or drinks listed above? If so, what did you think? If not, is there anything you’re craving? Tell us all about it in the comments below! This blog post about Eastern European food is brought to you by Nine Rabbits, the bestselling novel by Virginia Zaharieva now available from Black Balloon Publishing. A restless writer's fiery enthusiasm for her family's culinary traditions defines her from childhood to passionate adulthood as she strives for a life less ordinary. Lush gardens, nostalgic meals and sensual memories are as charming as the narrator herself. Virginia Zaharieva was born in Sofia, Bulgaria in 1959. She is a writer, psychotherapist, feminist and mother. Her novel Nine Rabbits is among the most celebrated Bulgarian books to appear over the past two decades and the first of Zaharieva's work available in English. Take your drinking-while-reading habit to the next level. David Chang, the chef behind Momofuku, discusses fried chicken, David Bowie and girlfriends who like Desperate Housewives. Whether you’re into 50 Shades of Grey or Ernest Hemingway, here’s your guide to dining like your favorite characters.